Home » THANKSGIVING » The Gratitude Life! The basic meaning of gratitude is thankfulness. It means to really notice the intricate pleasures of daily life, acknowledge them as blessings and say ‘Thank You’ for them. Expressing gratitude daily requires us to live our lives as a gift, a miracle and a privilege. However, this requires continuous consciousness and being present mentally in the ‘now’ of life to do so. There have been numerous scientific researches carried out to show the effect of living a Gratitude centered life and the results has been profound. One of the leading Scientists and author of the book “Thanks! How the New Science of Gratitude Can Make You Happier”. Dr Emmons has been studying the effect of gratitude in man for over a decade. One of the main things his studies have showed time and time again is that the benefits of living a life of gratitude outweigh a life without it. He has also shown that gratitude indeed does create happiness and increase our awareness of the goodness of life. Gratitude is important to our spiritual well-being and continuous growth and development as Christians. Expressing our thankfulness consistently, over a period of time to God, draws us closer to Him. Along the way we begin to realise that God is the one who provides for us daily and makes everything available to us. This in turn through the spirit of humility keeps us dependent on God for His best for us. Psalm 106:2 encourages us to “Praise the Lord. Give thanks to the LORD, for He is good; His love endures forever. Being thankful in an increasingly ungrateful world can be quite a challenge that is why cultivating a heart of continuous gratitude and praise requires us to be intentional about it. We can give thanks and praise God anywhere and way we choose too, but for it to be a continuous habit we have to be practical about it. For instance we could keep a gratitude Journal where we log our ‘thank you’ in it daily, weekly or periodically what you are thankful to God for. We could also make a habit to Give thanksgiving prayer at the end of each day, week or after a project or task. Expressing gratitude to others for their help, support or friendship towards us, this is also a good way to embed gratitude into our lives. This free resource – Continuous Gratitude is encouragement to embrace gratitude as a lifestyle choice ,one you won’t ever regret. So go on, why not choose gratitude over ingratitude; live a life filled with thankfulness to God for all he has done and His future plans for you. 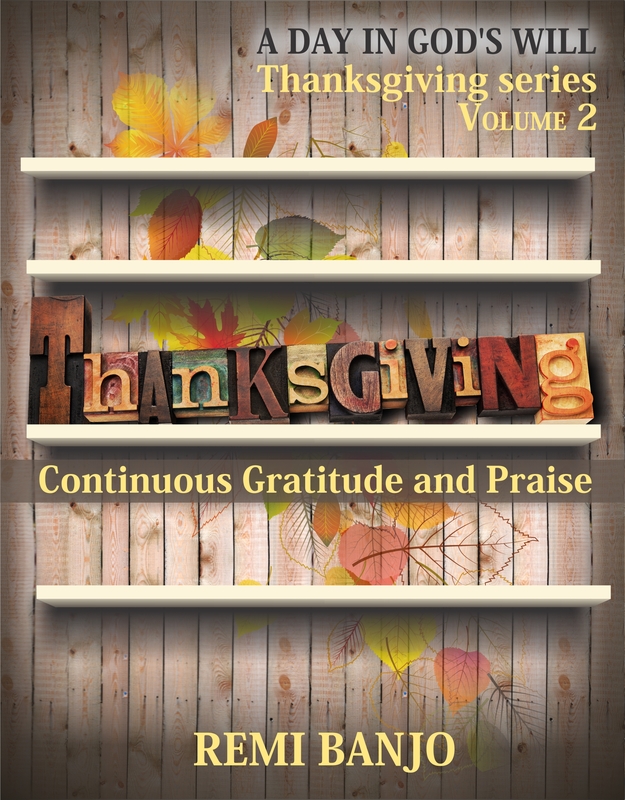 Download your free copy of Continuous Gratitude by clicking on the book picture below.